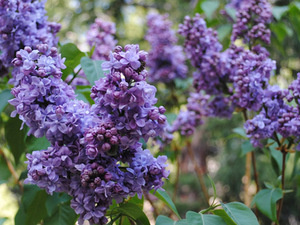 Gary Parton, a retired schoolteacher, whose Idyllwild garden boasts 255 different lilac bushes. Parton hosts his Lilac Walks, a 30-minute guided tour around his one-acre estate through the end of May. Daily tours (except Monday and Tuesday) are held from 9 a.m. to 4 p.m. for $5 each. He also sells potted lilacs.